Hailing from West Bengal, India, and choosing to conceal their identities, the three members of the atheism-preaching Heathen Beast have been active for five years, and The Carnage of Godhra is their best work to date. 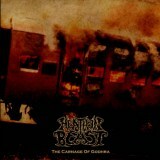 Moving away from the traditionally esoteric topics of black metal towards real-life events, the 2002 Godhra train burning which left 59 dead is depicted on the cover art, the band bemoaning the madness of religious sectarianism in their lyrics. Musically, this is raw and fuelled as much by traditional Indian music as it is European black metal; there are hints of everyone from Melechesh to Behemoth but the style is pretty original, and more than enjoyable. If I had to criticise, then the songs can seem a little too long at around six minutes each, and a little more variation in Carvaka's screeched vocals would be an improvement. Still, these are relatively minor issues; the passion in his voice definitely comes across, and the length of the songs allows the band to do interesting things with the structure and use of ethnic instruments. Metalheads exist in every country, as if we need to be reminded, yet there's not always enough individuality and variety on show. Heathen Beast take a step towards remedying that, and I look forward to more good metal from the band in the future. The Carnage of Godhra is available on a name-your-price basis from the Bandcamp link above.